Say, that doesn't look right. Luckily, whoever put this pole in the middle of the highway did remember to put a reflector on it. Otherwise there might have been some risk to motorists. I say "whoever" because nobody seems to know who exactly was responsible for the "puzzling appearance of a utility pole" in the middle of Highway 251 in Quebec. Local media reported that the pole appeared a couple of months ago, but provincial transport authorities insisted the road was still under construction as of early November and so the pole could not have been in the middle of it then. In other words, it would be more accurate to say that the pole did not "appear" in the road, the pole was there first and the road was paved around it. Of course, the end result was the same either way, and why no one thought it might cause problems is still not clear. Nor did the utility companies who put their wires on the pole have a good explanation, though the transport authority does not appear to have blamed them. The National Post reported that a spokesman for Transport Quebec said there had been "communication problems" between his agency and the utilities, though he did not elaborate. He did admit, however, that the current situation was "unacceptable." Not so unacceptable, though, that they would be removing the pole immediately—he said on November 19 that the problem would be fixed "by the end of the month." For those concerned about the continuing risk in the meantime, a government official stopped by to say that precautions would be taken "to ensure there was adequate signage in the area." Oh, good. Do you already have signs that say "WARNING: POLE IN MIDDLE OF ROAD AHEAD" or will you need to have one made? As it turned out, there wasn't time for that anyway. 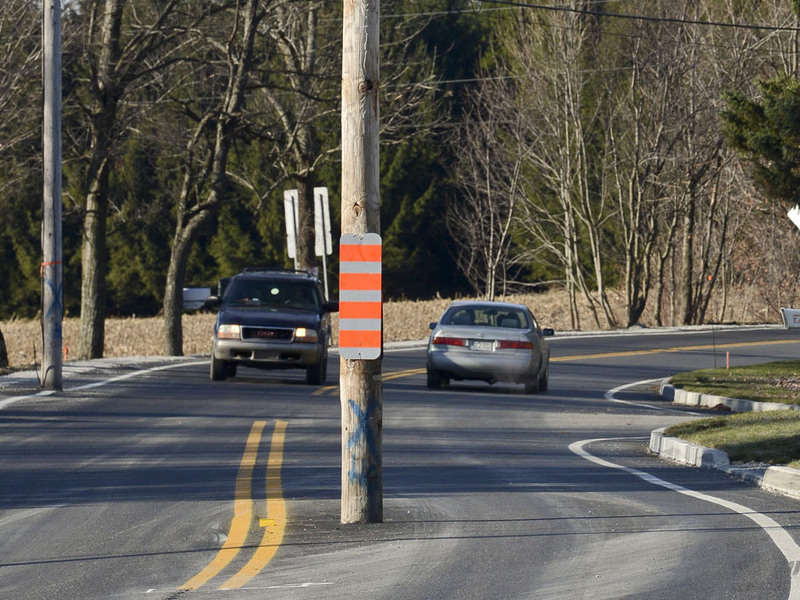 After pictures of the pole turned up in newspapers across Canada on November 20, the pole disappeared later that day (though less mysteriously than it had appeared). The pictures, though, are timeless. In 2010, the city of Cranston, Rhode Island, admitted that after a six-month investigation it still had no idea who had put up about 700 of its 2,600 stop signs. See "City Baffled by Hundreds of Mysterious Stop Signs," Lowering the Bar (Dec. 13, 2010). Local attorneys had figured out that many of the signs weren't official, and were persuading judges to throw out tickets given for running them. Eventually, the city gave up trying to unravel the mystery and just passed an ordinance to authorize most of the signs retroactively. This also took a couple of months to get done, but then these weren't sitting in the middle of the road.